Based in the South West of the UK, Dumnonika is a re-enactment and living history society representing life in the British Iron Age. Two thousand years ago the British Isles were inhabited by a people with a fascinating and wonderful culture, a culture that we catch occasional glimpses of in archaeology and the writings of their Roman conquerors. In Dumnonika we strive to use the evidence available to present the most accurate portrayal of these people possible, to educate and entertain the public, opening their eyes to Britain before Rome. Using the old British 'Celtic', 'Dumnonika' literally means 'of the Dumnonii', a British tribe originally inhabiting Devon, Cornwall and parts of West Somerset. 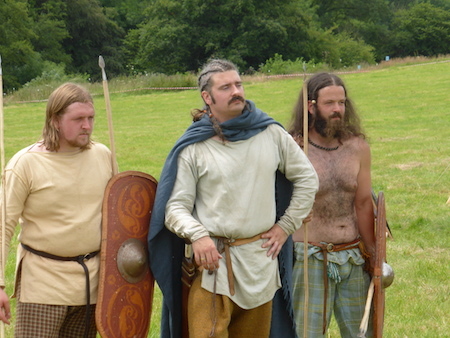 Unlike most Iron Age re-enactment groups we focus our presentation (where possible) on a specific area and time period, avoiding a mixture of kit separated by hundreds of miles and hundreds of years. By covering the last century of the British Iron Age in the South West, 50BC to AD50, we can present a people who have seen their world shattered by the Roman conquest of Gaul and are concerned about when Rome's armies will come to Britain, but are still definitely British and not Romano-British. We can show the colour and culture of the British people that existed even before Rome's 'civilising' influence, or work alongside Roman groups covering the invasion.